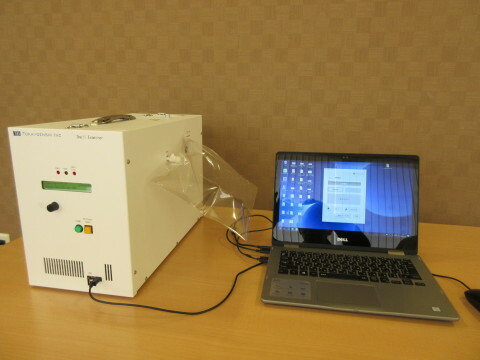 Tokai-Denshi Inc. and The Shizuoka Cancer Center Research Institute jointly developed an A.I.-based Portable Odor detector/Identifier which analyzes malodorous components emitted from cancer patients. During the advanced stages of cancer, especially in patients with uterine and breast cancer, occasionally there is a strong odor or “sick smell”. Patients often can become annoyed by the odor, suffer pain, and often times their medical care life is extremely difficult. If there is a device that can analyze the disease odor elements easily with high accuracy, it can help doctors select the optimum deodorizing method (the method of treating the affected part and the type of deodorant). This will allow for specialists to choose which treatments and how best to apply them to the care of each patient. Therefore, this device is made possible by the cooperation of the Pharma Valley Center (Director: Katsunori Ueda) at the Ministry of Economy, Trade and Industry for the FY 2013 and 2014 medical device development project (comprehensive special zoning promotion commission fee) “for odor measurement using odor sensor”, The Shizuoka Cancer Center Research Institute (deputy director Masatoshi Kusuhara), and Tokai-Denshi Inc.
Up until now, odor measuring devices and the like have been on the market. However, since there was no device capable of identifying the kind of odor like human olfaction, until now patients have had to rely on the smell of doctors and nurses. At this time, the Portable Odor Detector/Identifier developed by Tokai-Denshi Inc. has made it possible to identify dozens of odors. The system consists of artificial intelligence and a portable simple gas chromatograph, and the A.I. inside the system learns the odor component, thereby making it possible to distinguish odors. People can easily distinguish odors drifting through the air. This is largely due in part to the work of about 400 olfactory cells. Odor is absorbed by olfactory cells and is replaced with electric signals and transmitted to the brain. This time, the disease odor measuring device began with a survey of gas sensors that can distinguish odors and VOC gases (volatile organic compounds). However, the biggest challenge was it is difficult to obtain the sensitivity of human olfactory cells and the ability to discriminate odors. Therefore, we developed a highly sensitive and portable gas analyzer (simple gas chromatograph) capable of separating and identifying nearly 100 kinds of VOC gases, and solved the problem by installing artificial intelligence. Through using artificial intelligence, we discover individual features and weak changes. This makes it possible to identify odors by learning the characteristics of odors in each. As a sensor that detects odors, a high sensitivity sensor that can detect 5ppb to 200ppm using a non-concentrated gas was used. This was using a PID sensor (photoionization detector) and a semiconductor gas sensor. In addition, by using a 30m long gas analysis tube (capillary column), the odor gas was separated and the analytical performance was improved. The odor is analyzed by searching for features using artificial intelligence detection signals obtained from the surrounding air. The device starts with “learning” the sick odor as well as mimicking the human olfactory sense in order to perform accurate odor determination. We acknowledge that odor detection can be used not only in the medical filed but also in various other situations. As such, we will develop devices specifically tailored to categorical odor identification rather than universal odor identification. By studying by category, since the kinds of gases that specify odors are almost the same, it is expected that the discrimination ability (correct answer rate) will be further improved. In other words, odor classification category detection can be customized to the device such as offensive odor from a livestock farm, a poultry farm, a pig farm, a food processing factory, air pollution of chemical plant, scent development such as food sample, halitosis measurement, drug or doping inspection etc. Looking forward to the future, we are looking to prepare a free monitoring machine and recruit collaborative research laboratories or companies while we continue to develop high sensitivity judgment and super sensitivity sensors exceeding human olfactory ability. By 2020 we plan to complete the next generation artificially intelligent electronic nose for commercialization in the medical, drug, pollution, food, and aroma industry. It can be set by category of odor (number of input variable nodes, number of hidden layer nodes, learning rate, activation function, parameter update, overfitting control). Judgement Output A user can make this system learn odor type through 50 ways or 6 stages of odor intensity. It has 20 kinds of measurement sequences and can be selected on the PC screen or measured with the dial type measurement menu. PC-less Measurement In the case of PC-less measurement, after downloading from a USB, PC analysis is possible. Time Table Measurement With the time table function, you can program measurements of up to 9 types of daily, hourly, constant time interval etc.